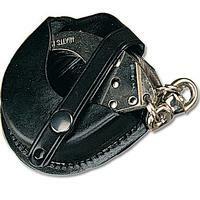 This open top pouch is ideal for a standard pair of handcuffs joined with a chain. It is provided with a strap which is fastened with a stud fastener. A very hard wearing, well constructed pouch, accomodating a 2 inch duty belt and weighing 2 1/2 oz, 72 grams. The handcuffs in the picture are not included!